Well…. it’s here. The first of December and the kids are super excited about the calendar this year. Since last advent we have moved house…. so no fireplace to form the backdrop to our countdown. We even had to rearrange the lounge room last weekend to make space for the Christmas tree! As I was preparing this past week, Tim said he had just this year realised, that I was going to do ‘this advent thing’ every year. He then said he was glad. We don’t have that many traditions that are just for our little family. So….. bring on the manic month of December….. and we will keep reminding ourselves that Christmas is all about Jesus! We will be using the Luke readings we used a couple of years ago…. and some of the activities that really worked. I have included some new activities as well this year. The contents of the glass balls give a hint to what we might be doing. Can you guess any? Are you adventing this year? I would love to hear your plans. A string of advent balls. How Pinteresting are ……… Advent Calendars? Lots and Lots of Advent Ideas. Click on the image to take you straight through to Pinterest. I love this one. So simple, inexpensive and beautiful. As requested by Meredith, How pinteresting are Advent Calendars? What a great time to start thinking about and through the sorts of activities you want to do to keep your Christmas all about Jesus. The collection has not just visually great ideas but suggested activities and readings. If you are interested in what our family have done over the last few years your can see it here for 2009 and here for 2010. Last years advent can be found here in reverse…..I need to fix that! Who know’s what we will do this year? ….also please let me know if you would like me to collate a special grouping of things you are interested in. It is an interactive series. I hope you enjoy this one, and I look forward to hearing your plans and comments. How Pinteresting is ………… art making with books? Portraits made of books. Image from My Human Computer. Yes ‘How Pinteresting?’ is still interactive. Please leave your ideas for pinning in the comment section below. But….to continue with my extended book week posts, I have put together a group of images related to the book. You can find them by clicking here. And don’t worry Ali….. I have pushed your idea for pinteresting caravans and airstreams until next time…… hope you don’t mind. 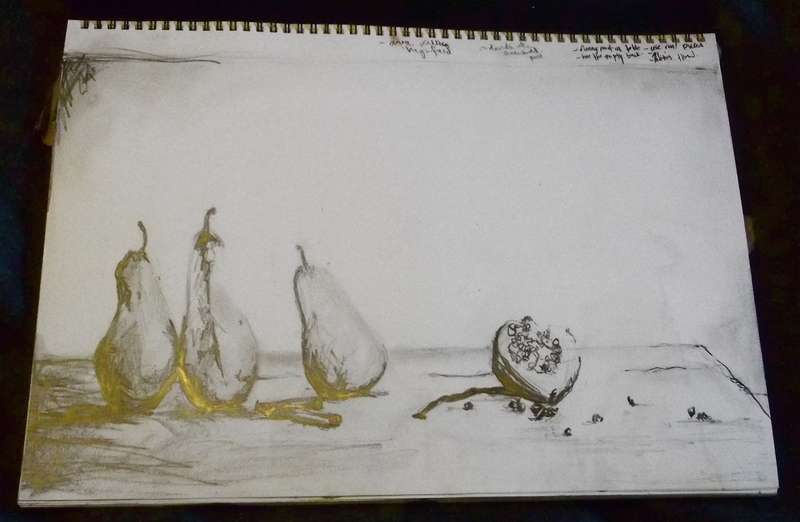 More details of ‘Three pears and a pomegranate’ Click on image. Thanks to everyone who gave me feedback on where to start creating again. These are some shots from the classes so far. 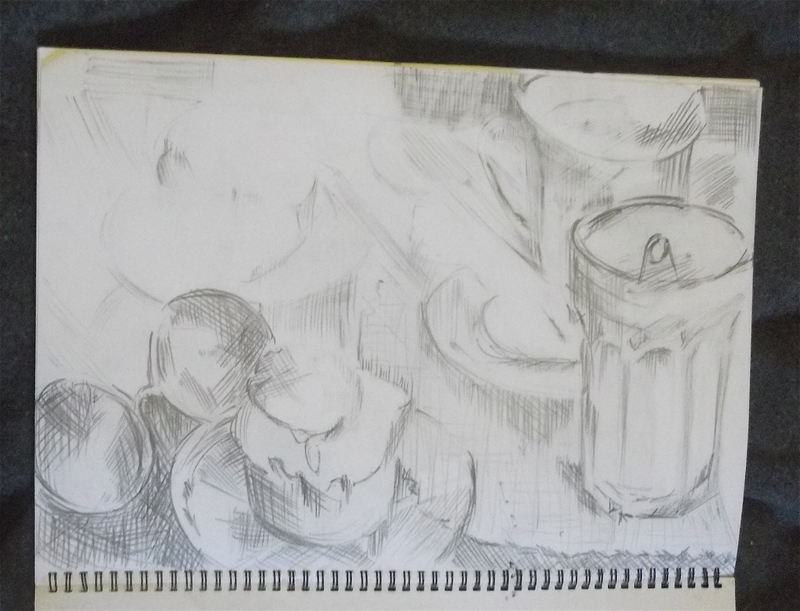 I was a bit out of practise and unsure so I spent some time sketching, using the inspiration you all suggested. This is what the first week produced. This image from decor8 became…..
…. became this pencil sketch. …. this very ‘not really convincing’ pencil sketch. 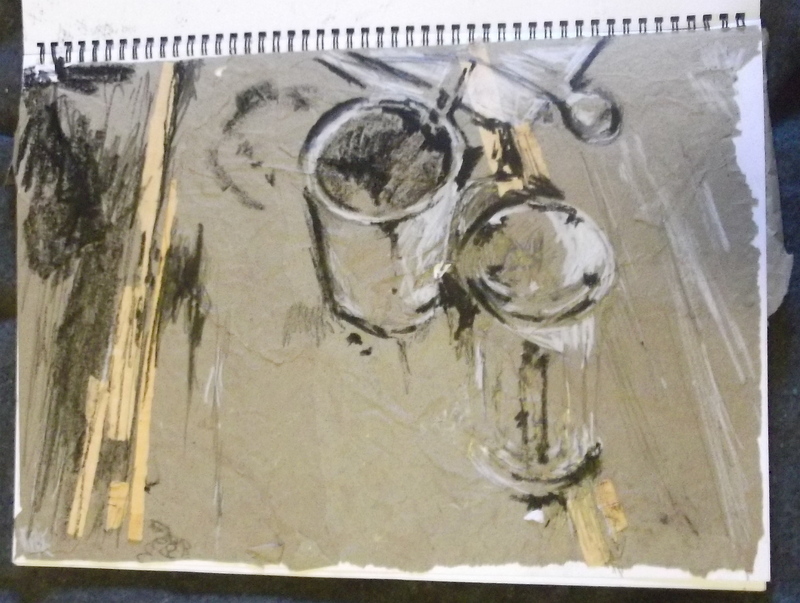 ….. this little A3 collage (brown paper with ‘pencil paper’, charcole ad pencil. I am quite pleased with this one. 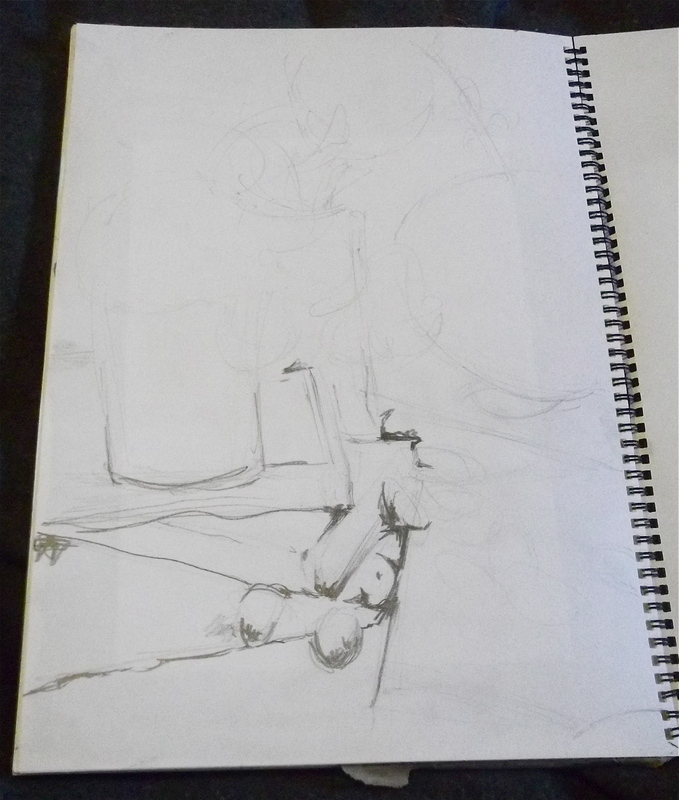 During the making of the collage I put a sheet of graphite carbon paper underneath as I worked. This was the result. Interesting as every mark comes out the same colour. 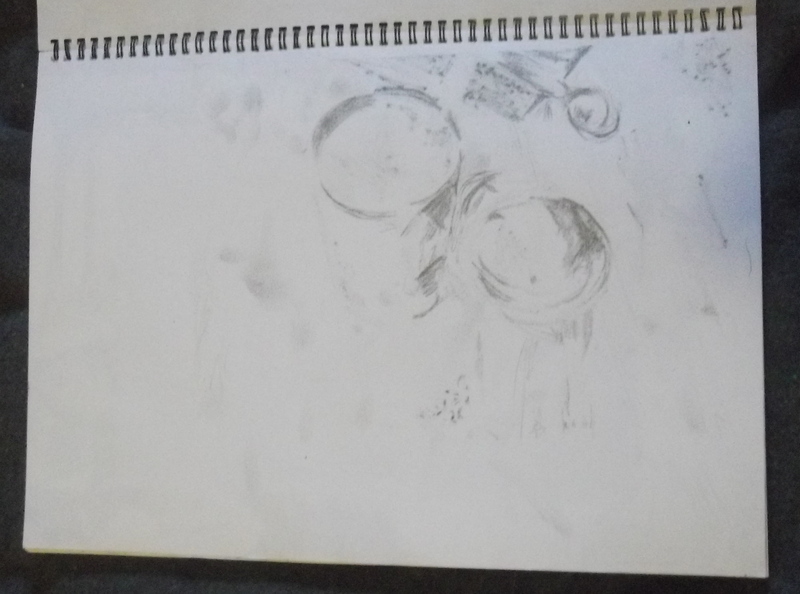 …..became this pencil ‘hatching’. Surprising myself a little by how much I enjoyed making this. I am pleased with the result. During the second week I developed a couple of these ideas. Using the pears and pomegranate I worked with crumpled handmade paper, collage, cross hatching, ink, pencil and stitching to start creating an artwork. It will take a while to finish….. lots of stitching to come. The beginning of the A1(ish) work. If you would like to follow along with the creations, that is the place to go. I will link to it occasionally, and it will be purely notes and pictures. I would love and welcome any feedback via comments….. even negative ones. See you soon when you can help me decide where to go next. This week I start art class after a very long break. More out of convenience than anything else I have enrolled in ‘continuing projects’. The problem is….. I am sort of starting a fresh rather than continuing so I need your help. Over that last couple of months I have been collecting still life images (because I am fascinated by the comfortingness of them). I think I would like to recreate them as drawings or paintings or collages …. or maybe even something all together different. I would love to experiment with stitching and fabric within works too. Please help me out by letting me know in the comments which images appeal to you and how you would like to see them recreated. I am not promising to obey your every visual wish but your feedback would help enormously. Thanks. 1. 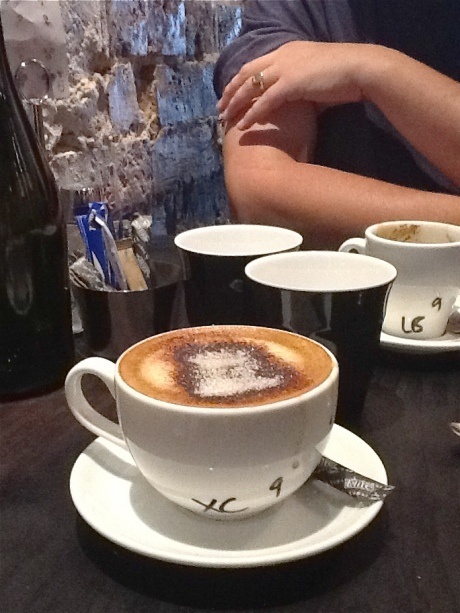 Latte and sunnies.Image from the bottom of my laundry basket. 2. Muffins on a board. Image from Modern Country. 3. Spilt coffee.Image credit decor8blog. 4. Extra strong cappacino. Image mine. 5. French press and small bites. Image from decor8blog. 7. A vase, a painting and a deer. Image the lennoxx. 8. Napkin with sprig and duck egg.Image from the house of Turquoise. 9. Pink flowers in a lime vase. Image from the house of Turquoise. 10. Sweet peas and mini bird eggs. Image from the house of Turquoise. Please give me some direction…. even if it’s just the number of the picture. ….and yes, I will do some updates as to how the classes and paintings are going. May even have a give-away, but only if you help me know where to start.